Ponyboy Curtis, a member of the greasers, a gang of poor East Side kids in Tulsa, leaves a movie theater and begins to walk home alone. A car follows him, and he suspects that it is filled with a bunch of Socs (pronounced "sohsh-es"), members of a rich West Side gang who recently beat up his friend Johnny. The car stops, and several Socs emerge and begin roughing Ponyboy up and try to cut off his hair. Ponyboy's cries for help alert his brothers and fellow greasers, and the Socs flee. Afterward, Ponyboy's older brother Darry, who is also his guardian since their parents' death, scolds him for walking alone. The next night, Johnny and Ponyboy go to the drive-in with fellow greaser Dally. Despite Dally's unpleasant behavior toward two Soc girls, Ponyboy strikes up a friendship with one of them, whose name is Cherry Valance. Ponyboy tells her about the Socs' attack on Johnny, and she insists that not all Socs are like that. Cherry tells him about some of the problems Socs have, and they find out they share a love of watching sunsets. The girls and greasers walk out of the drive-in together, and are confronted by a Soc named Bob, who is Cherry's boyfriend, and his friends. Things almost come to blows, but Cherry puts a stop to the confrontation by leaving with Bob. Before going home, Ponyboy talks with Johnny in the vacant lot and falls asleep. He returns home late, and Darry gets so angry that he hits Ponyboy, who runs from the house and goes with Johnny to the park. There, they run into Bob and his Soc friends. The Socs attack, dunking Ponyboy's head into the fountain. Johnny stabs and kills Bob. Dally helps them escape town. The boys take refuge in an abandoned church in the countryside. There, they cut their hair to disguise themselves and then spend five days talking, smoking cigarettes, and reading from Gone with the Wind. Dally comes to visit them and, on the way back from a restaurant, they find the church in flames. Johnny and Ponyboy run inside to save a group of schoolchildren who have come to the site for a picnic. They save the children but are all injured, including Dally, and are rushed to the hospital. At the hospital, Ponyboy recognizes for the first time how much Darry really cares for him. He also learns that Dally will recover, but Johnny's condition is extremely serious. The next night is set for a rumble between the greasers and the Socs. Ponyboy talks with Randy, Bob's best friend, who says that he has decided not to fight because after Bob's death he has realized it won't accomplish anything. Ponyboy is not feeling well, and he, too, is skeptical about the purpose of fighting, but he does participate in the rumble, which the greasers win. Afterwards, Dally and Ponyboy go to visit Johnny in the hospital, where they hear his last words: "Stay gold, Ponyboy. Stay gold." In despair over Johnny's death, Dally flees the hospital, robs a grocery store, threatens the police with his unloaded gun, and gets shot dead. Ponyboy, in worse health after the rumble, is unconscious and delirious for several days. When Ponyboy recovers, the Socs and greasers attend a court hearing. Johnny is vindicated by all witnesses as having acted in self-defense. However, Ponyboy is depressed, his grades begin to suffer, and he almost turns to violence. His English teacher offers him a chance to pass by writing a final essay on the topic of his choice. Ponyboy can't think of a topic, though, and he and Darry fight about his lack of motivation. Sodapop becomes upset, and pleads with the brothers to stop fighting because it is tearing him apart. Ponyboy and Darry agree not to fight anymore. Back at home that night, Ponyboy examines a copy of Gone with the Wind that Johnny left him. Out of it drops a note, written by Johnny, urging Ponyboy to keep his idealism and never give up hope for a better life. Ponyboy decides to write his essay about his experiences during the last several weeks. With it, he hopes to bring attention to the plight of boys like himself and to honor the memory of the ones who died. The first sentence of the essay is the first sentence of the novel. Fogt, Lis. "The Outsiders Plot Summary." LitCharts. LitCharts LLC, 22 Jul 2013. Web. 10 Dec 2018. Fogt, Lis. "The Outsiders Plot Summary." LitCharts LLC, July 22, 2013. 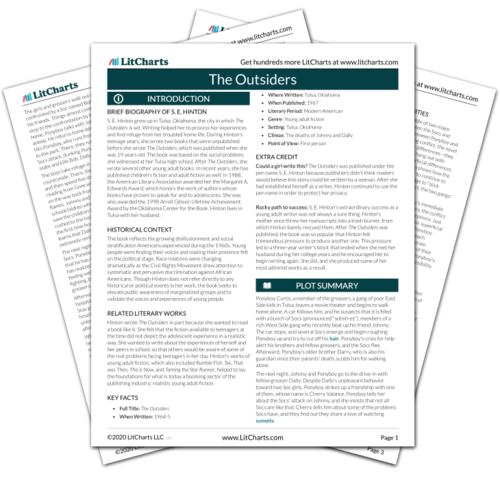 Retrieved December 10, 2018. https://www.litcharts.com/lit/the-outsiders/summary.